Therese Mc Allister is an Irish artist who studied at the National College of Art and Design, Dublin and Studio Simi ,Florence Italy On her arrival in Florence, she met Pietro Annigoni (renowned for his portraits of the British Royal Family) who encouraged her to enroll at the Studio of Nerina Simi. Here, under the tutelage of Signorina Simi, she studied the techniques of drawing and painting in the classical tradition. Nerina Simi, a highly gifted and talented artist came from a long line line of talented painters and she dedicated herself to teaching (her father, Filadelfo Simi, studied with Jean -Leon Gerome in Paris in the late 1800's.) Aloysius C. O'kelly a well known Irish artist also enrolled at Geromes atelier in 1874. Gerome in his turn studied with Paul Delaroche and Charles Gleyre 1806-74. Pupils came from all over the world to study with Simi and many well known contemporary artists passed through her studio. Therese also made frequent visits to Pietro Annigoni's studio where he advised and encouraged her on her work.. 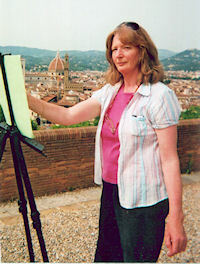 Her many years of artistic education, has taken her from Dublin to Florence. The Simi system concentrated on precise drawing and observation and the accurate rendering of forms and space. Working mainly in oils, her darkly-glowing still-lifes are rich and vibrant in colour with a meticulous attention to detail. Life drawing was also an important part of the curriculum and as a result Mc Allister is a highly accomplished draughtswoman and a talented portraitist. her work is included in collections in Ireland, England, Italy, France, Greece, Canada and the United States.